For the one-woman show, 'Bad Dates', the script calls for shoe boxes, and lots of them! 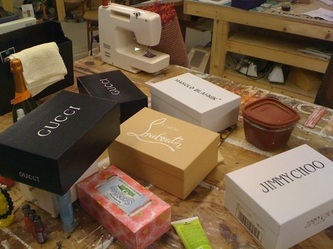 While we managed to collect lots of shoe boxes from local stores and donors, we wanted some higher end boxes for a few of the 'splurge' shoe purchases. Using photo boxes, I traced and painted logos from high-end shoe brands.